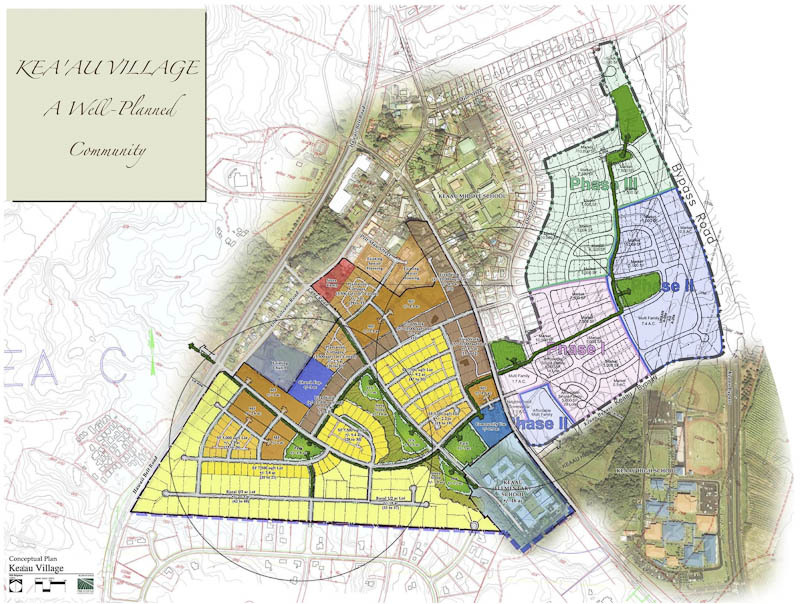 Recognizing that Keaʻau Village’s strategic location would dictate its future, W.H. Shipman, Limited, which owns much of the land in and around the village, identified and is planning for what that future will be. The Community sees Keaʻau as a walkable town with close-in neighborhoods, with the district’s civic, community support and commercial services at hand. The plan calls for Keaʻau Town to be built on its ranching and plantation heritage by perpetuating appropriate architectural and landscape themes. W.H. Shipman, Limited hired PBR Hawaiʻi to help with its Master Plan, and local architect Boone Morrison to take the community’s input to maintain a plantation-style look and feel for development so it would keep the cultural and historic flavor of the area. Residential villages linked with an open space trail system will accommodate future residential growth.